Everyone has a story to tell but it takes a real fighter to share their story. The road to home ownership can be tough, there may be bumps along the way, but if you’re shown the route, you’ll reach the destination. Have you ever been told you can’t own a home? Kristen, a young Realtor® from the Lansing area was. Kristen had no credit because her motto was, “stay clear of debt.” Without realizing it, Kristen limited her opportunities by doing so. Kristen was nervous. Can you imagine being turned away numerous times? Talk about feeling a million miles away from owning a home. Reaching home ownership seemed impossible and without guidance, it was. Over the course of a few years, Kristen went from place to place trying to get pre-approved. She had no luck. It wasn’t until Kristen fell into the real estate business that she realized owning a home is possible if someone showed her the steps. Kristen ‘s life took a toll. She learned through friends, clients, her boss and business partners. All together, they showed her how to own a home. Kristen’s fear was slowly going away, but she still didn’t believe it was possible. This mindset stayed with her until she made it to the closing table.. “I never thought I could own a home until I was handed the keys,” say’s Kristen. Her whole life she was afraid of the unknown and if she could give any advice to buyers, it would be too lose that fear. Owning a home is easy, the expenses aren’t that different from an apartment rent (Kristen). The road to home ownership took work for Kristen. Kristen had to open up a credit card to build her credit and it wasn’t until ten months later that Kristen was approved for a mortgage. She signed the papers, got the keys, and knew she was a homeowner! Currently, Kristen is doing some home renovations before moving in. She’s giving the walls a new touch of color and updating the floors! Owning a home is a big step in a person’s life. 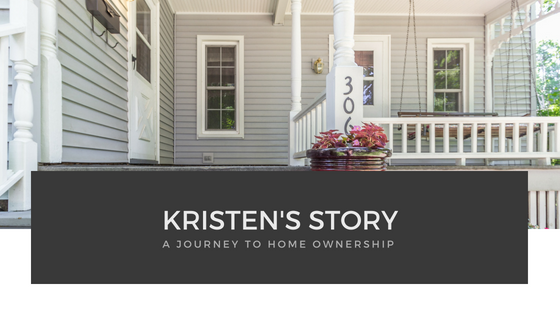 The road to home ownership can be tough but if you’re shown the steps than you’ll own a home just like Kristen!